Text by Heinrich Dubel, Brigitte Felderer, David Moises, Robert Pfaller, Bernhard Seiter. Artist, technician and DIY enthusiast David Moises (born 1973) is fascinated by mechanical devices, which he analyses, takes apart and reassembles in unexpected ways. 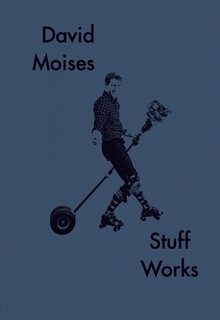 Stuff Works demonstrates exactly how the artist’s creations function, through illustrations and inventions inspired by the handyman magazine Hobby. Clth, 6.75 x 9.5 in. / 200 pgs / 150 color.